In polytechnic, teaching a group of phlebotomy students without clinical experiences, the topic of “approaching the patient; the role of a phlebotomist” is challenging, yet fulfilling. The challenging part is to ensure the learners are able to comprehend the implications of patient safety taught in the topic and apply what they have learnt. If the learners demonstrate the desired clinical skills, the sense of fulfillment is realized. Gagne’s instructional model1 has been used widely to teach procedural skills.2–5 As Robert Gagne has categorized the five learning outcomes as intellectual skills, verbal information, cognitive strategies, attitudes, and motor skills, the Gagne’s nine events of instruction (Table 1) provide an instructional framework to achieve these outcomes. Consequently, I deliberated on the contextualization process of Gagne’s events of instruction in phlebotomy education, and describe here the lesson plan for the topic of approaching the patient. It is necessary that the learners have prior knowledge about the topic of preanalytical variables. Preanalytical variables refer to those factors that are associated with the pre-examination phase of the clinical laboratory testing process.6 Generally, preanalytical variables can be categorized into patient variables, variables in blood collection technique, transportation variables, and specimen variables. Table 2 presents a myriad of preanalytical variables that are related to blood specimen collection. 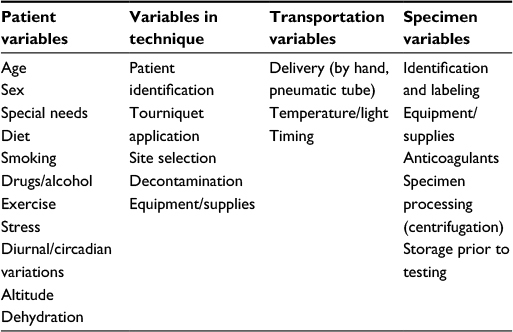 As these variables address the quality of the blood specimens collected in a clinical setting, knowledge of these variables forms the prerequisite for the lesson. Usually, a separate lesson is required to address this topic in its entirety. 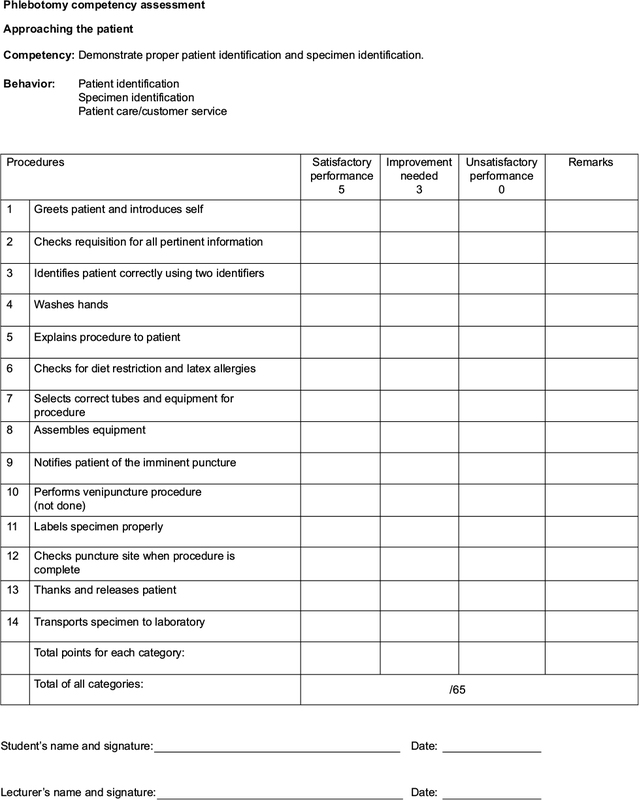 To highlight some of the preanalytical variables listed in Table 2, the role play activity (Table 3) is employed to set focus on patient variables (fasting), variables of technique (patient identification), transportation variables (pneumatic tube), and specimen variables (specimen labeling). 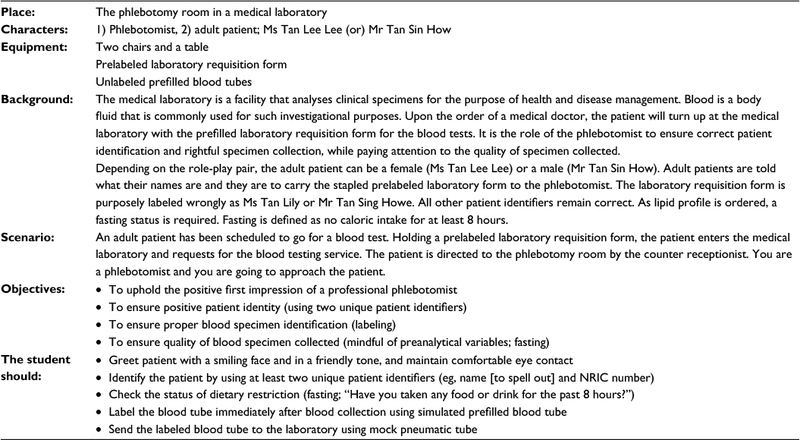 Learners need to pay attention to the requirement of a fasting blood sample and should be able to pick up the wrongly typed patient name on the laboratory requisition form. Hence, the intent of such a role-play activity is to train the learners to take a conscientious effort in ensuring quality blood collection. Such procedural tasks, although cumbersome, are highly recommended, as it reduces errors related to patient identity.7 Conversely, learners are also encouraged to ponder upon the consequences of a nonfasting lipid test result. Learners need to point out that a nonfasting lipid test result misinterpreted as a fasting one could possibly lead to a patient being put on an aggressive course of statin therapy unnecessarily or subject a patient to an unwittingly adjusted dosage of an ongoing statin without the evidence of a reliable blood test result. Abbreviation: NRIC, National Registry Identification Card. A lesson plan for the topic was developed using the Gagne’s nine events of instruction1 and each of the events is described in the following sections. perform proper blood specimen identification. After spending approximately 5 minutes on recalling, I will move on to deliver my presentation. The intent is not to drag the recalling phase so long that the learners lose focus and interests. There is a saying that goes, “first impressions last.” Hence, the first rightful demonstration with step-by-step explanation is a good starting point for learning. This practice concurs with the law of primacy10 and the first step in the Peyton’s four-step approach to teaching (demonstration–deconstruction–comprehension–performance).17 To begin, I “demonstrate” how I approach the patient politely, identify the patient correctly, label the blood tubes rightfully and dispatch the blood tubes in a timely manner. Next, I “deconstruct” the patient approach by explaining the rationale for each step taken, and encourage the learners to ask questions for better “comprehension.” This process engages the learners’ linguistic, kinesthetic, and interpersonal intelligence,13 and stimulates the reflectors to ponder.18 Furthermore, the read/write style of learners8 can be engaged by encouraging them to jot down notes for future references. To demonstrate effectively, I have to position myself before the whole class and ensure all learners can hear and see me and my “patient” before I begin. At the end of the lesson, a lesson summary bullet pointing the learning objectives that has been covered is given. I will also allocate some time to clarify any doubts that the learners may have. The Gagne’s instructional model is a systematic approach to learning and its usefulness has been advocated in medical and nursing education.2,22 Using the Gagne’s nine events of instruction, it caters to the different learning styles of learners and facilitates the learning processes of learners. To maximize its usefulness, the lesson plan can be contextualized to the other topics of phlebotomy like venipuncture and capillary puncture. Gagne RM, Wager WW, Golas KG, Keller JM. Principles of Instructional Design. 5th ed. Mason, OH: South-Western; 2005. Belfield J. Using Gagne’s theory to teach chest X-ray interpretation. Clin Teach. 2010;7(1):5–8. Khadjooi K, Rostami K, Ishaq S. How to use Gagne’s model of instructional design in teaching psychomotor skills. Gastroenterol Hepatol Bed Bench. 2011;4(3):116–119. Buscombe C. Using Gagne’s theory to teach procedural skills. Clin Teac. 2013;10(5):302–307. Ng JY. Combining Peyton’s four-step approach and Gagne’s instructional model in teaching slit-lamp examination. Perspect Med Educ. 2014;3(6):480–485. Hawkins R. Managing the pre- and post-analytical phases of the total testing process. Ann Lab Med. 2012;32(1):5–16. WHO. WHO Guidelines on Drawing Blood: Best Practices in Phlebotomy. Geneva: World Health Organization; 2010. Fleming ND, Mills C. Not another inventory, rather a catalyst for reflection. To Improve the Academy. 1992;11:137–155. Available from: http://digitalcommons.unl.edu/cgi/viewcontent.cgi?article=1245&context=podimproveacad. Accessed September 26, 2015. Knowles MS. The Adult Learner. A Neglected Species. Houston: Gulf Publishing; 1973. Available from: http://files.eric.ed.gov/fulltext/ED084368.pdf. Accessed October 28, 2015. Thorndike EL. The Fundamentals of Learning. New York: Teachers College Press; 1932. Braungart MM, Braungart RG, Gramet P. Applying learning theories to healthcare practice. In: Bastabel S, Gramet P, Jacobs K, Sopczyk DL, editors. Health Professional as Educator. Sudbury, MA: Jones & Bartlett Learning; 2011. Merrill MD. Constructivism and instructional design. Educ Technol Soc. 1991;31(5):45–53. Young JQ, Van Merrienboer J, Durning S, Ten Cate O. Cognitive load theory: implications for medical education: AMEE Guide No. 86. Med Teach. 2014;36(5):371–384. Sweller J. Cognitive load theory, learning difficulty, and instructional design. Learn Instr. 1994;4(4):295–312. Sutkin G, Wagner E, Harris I, Schiffer R. What makes a good clinical teacher in medicine? A review of the literature. Acad Med. 2008;83(5):452–466. Nikendei C, Huber J, Stiepak J, et al. Modification of Peyton’s four-step approach for small group teaching – a descriptive study. BMC Med Educ. 2014;14:68. Honey P, Mumford A. Using Your Learning Styles. Maidenhead, UK: Peter Honey Publications; 1986. Nestel D, Tierney T. Role-play for medical students learning about communication: guidelines for maximising benefits. BMC Med Educ. 2007;7:3. Joyner B, Young L. Teaching medical students using role play: twelve tips for successful role plays. Med Teach. 2006;28(3):225–229. Ramani S, Krackov SK. Twelve tips for giving feedback effectively in the clinical environment. Med Teach. 2012;34(10):787–791. Miner A, Mallow J, Theeke L, Barnes E. Using Gagne’s 9 events of instruction to enhance student performance and course evaluations in undergraduate nursing course. Nurse Educ. 2015;40(3):152–154. Garza D, Becan-McBride K. Phlebotomy Handbook: Blood Specimen Collection from Basis to Advanced. Upper Saddle River NJ: Pearson Education, Inc; 2015. McCall RE, Tankersley CM. Phlebotomy Essentials. Philadelphia: Wolters Kluwer; 2016.